Referring to the LP’s strategic plan for the coming years, the Party president stressed the importance of political communication and the need to train journalists and media-workers. He also referred to the ongoing recruitment drive of the Liberal Party. In the process of joining the party, the new members are invited to participate in orientation seminars on liberal democracy. These activities are conducted by National Institute for Policy Studies (NIPS), the liberal think tank and co-sponsored by the Friedrich Naumann Foundation. LP President Drilon also emphasized the importance of international cooperation among liberal parties and commended the role of the Council of Asian Liberals and Democrats (CALD). 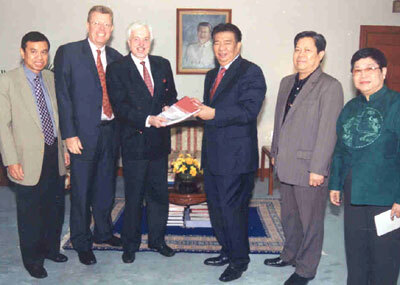 Over the years, numerous LP-members have participated in international programs organized by CALD. The Council of Asian Liberals and Democrats is the main regional partner of the liberal Foundation in East and South East Asia. The CALD secretariat is located in Makati City and shares offices with the Friedrich Naumann Foundation.